This post has almost nothing to do with sailing. But, as I mentioned in my previous post, we are scanning all of our papers and files to get ready for our liveaboard adventure. Tonight, as part of this process, I went through all my old University papers, throwing out much of it, except for essays and some notes from favourite classes or lectures. In the process I came across a nice card from my husband, and something I got paid to write in 1995 called, “Chicken Dinner Delight”. At the time, my employer asked me to write something about technical writing. But, since I didn’t have any experience yet as a technical writer, I wrote about something I did know about, shopping for chicken. This short work follows below. The opulent fleshy mass vacillated deceptively against the shiny packaging that bound it. The colour striations slashed inert. Yellow. Grey. Green. And red. Reminding me of the pulse of life that had once been. Reminding me of my own insipid mortality. Then, I thought of my dinner, and more importantly, the dinner guests. Cloven hooves, chewing of the cud? Ah – uncertainty. Sinewy tentacles pulsed in my own entangled brain. Excited electrolytes met neural synapses in a swift shudder of deepest profundity. A thought. To wit, to know a piece of chicken. The styrofoam creaked loudly, groaning with the distinctive squelch of fresh cornstarch. I approached my cart and grasped tightly at the helm. The wheels screamed with a wild, fiendish combination of terror and delight, extending the metaphor of life being just like a really, really big circle. Away we raced. Just me and the chicken delight. I detected the aroma of bologna uniting in a trance of ecstasy with the soft moist fruit decaying around it. I rushed along past the streams of people and entered the current where they, like their packages would be processed along the cash-driven conveyor belt. Surrounded by a sea of faces, promises of empty success and instant appetite. I hesitantly unfurled a tawdry piece of capitalist tender and executed the fowl purchase. Stylistically, this piece has “me” stamped all over it. But, I tend to use simpler language now, more so than when I was in university 20 years ago. I like images that employ all of the senses, and I like to use contrasting tone. You will notice that, even in my blog posts, I often start a highbrow piece and intermingle it with something decidedly pedestrian. I do this as much to relieve myself of a serious subject, but also to provide the reader with pause for thought. The “Chicken Dinner Delight” employs imagery from things I was studying or interested in as a university student. Considering its length, there is a lot going on in this piece. For example, I used imagery of the goddess Fortuna (see image below), and a reference to “synapses” – something I picked up in Psych 101. Not exactly Vanna White, the Goddess Fortuna was a construct of ancient and medieval times. 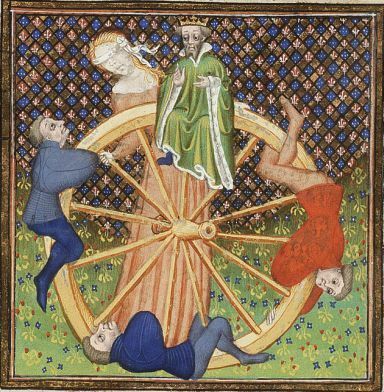 She was believed to determine fate at random as she spun the original wheel of fortune. As well, I provide a sense of movement using recurrent sailing and water imagery (see the words “helm”, “current”, “sea” and “streams of people”). I also give a nod to the Muslim faith and their abhorrence of pork. At the time when I wrote this piece, I was dating a Muslim, and was as poor as a church mouse, living in a bachelor apartment. For a short time, I ate unrelated, random cans of food for sustenance, eating basically whatever was available. My life of relative poverty and disdain for all things related to wealth is woven into this short piece. Fortunately, my finances improved. And, I worked as a technical writer for 10 years before going on maternity leave, and staying at home with our four children. Today, I am very interested in the creative thought process behind good storytelling. I gain inspiration from Andrew Stanton’s compelling TED Talk called, “The Clues to a Great Story“. I also enjoy the principles of simple writing, as outlined in William Strunk and E. B. White’s book, “The Elements of Style“.